Uses the cushioning capacity of the tie and a wheel-bump feature to lift the wheel slightly off the rail to absorb momentum. 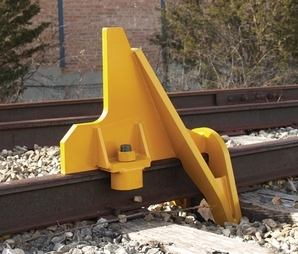 Recommended for spur tracks where more protection is needed than a conventional car stop can provide. Do not install on grades. Use bumping post inside buildings. For Exposed Rail Track If you have flush rail (rails encased in pavement), contact us before ordering. 1-3 cars. More frequently used side track.